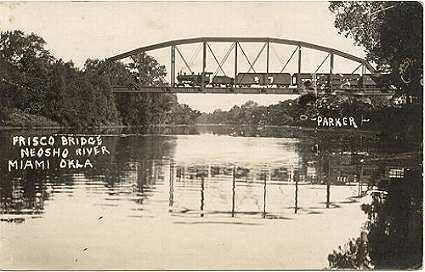 Passenger train on Frisco railroad bridge, Miami, Ok. This picture taken about 1910. 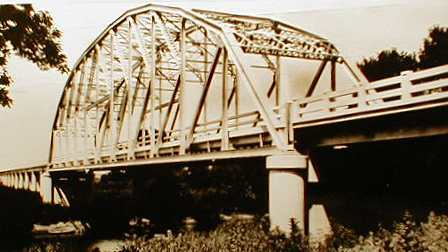 Photo courtesy of J. L.
Route 66 bridge over the Neosho River was called "Will Rogers Bridge" in this postcard photo. I never heard it called that, however. 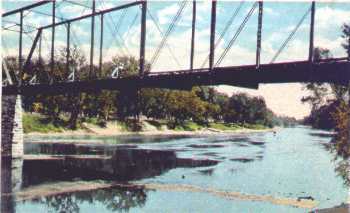 Bridge was replaced during the 1990s..
First bridge over the Neosho River was at the location of the bridge at Riverview Park. This view looks south and shows the river before it was dammed up at the park. Note how low the water is. This was the first of three bridges at this site. 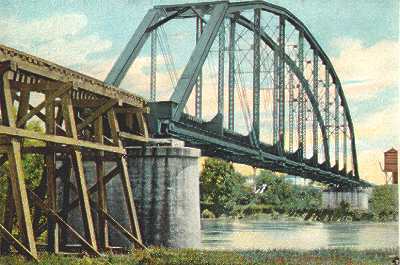 Another view of the railroad bridge. Note the water tower that supplied water for the steam locomotives.